Becoming a certified Mercedes-Benz repair facility is no easy feat, it requires a large investment in both specialized equipment and training in order to be approved by Mercedes-Benz Canada Inc. Nevertheless, our collision centre underwent this task in order to ensure your vehicle is repaired to the same level of quality with which it was originally built. Using our state-of-the-art equipment, we can ensure your Mercedes-Benz is returned to factory condition, no matter how severe the damage. We offer body repair, mechanical services, and expert paint matching to ensure that when your vehicle is returned to you like the damage never even happened. We also use nothing but the latest factory-developed materials to ensure our repairs will last the lifetime of your Mercedes-Benz. So if your your vehicle has been involved in an accident, or has body damage that you want to erase, then choose Weston M.B. Collision to ensure you receive the highest quality of service possible. Our repair centre is located at 108 Toryork Drive, making us easily accessible for customers across Toronto and surrounding areas. We understand that the unexpected can occur at any time, night or day. That’s why we offer 24 hour roadside assistance to our customers. You can call 1-800-387-0100 and ask to have your vehicle towed directly to Weston M.B. Collision. We’ll even work with your insurer to arrange a vehicle rental while you wait for repairs to be completed. 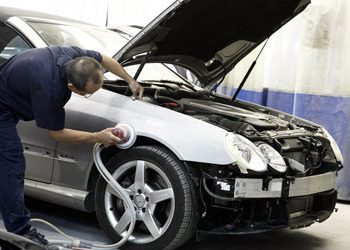 Is your Mercedes-Benz in need of body work? Trust the experts here at Weston M.B. Collision to make your vehicle look and feel like new again. Now you can contact us from the comfort of your own home or office. You can also call us at 416-740-8790 and our team of customer service representatives will work with you to get the service you need. 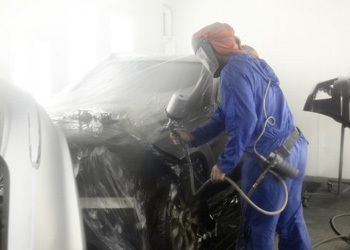 If you’re interested in learning more about our facility, and how we ensure your Mercedes-Benz receives the best possible care, visit our collision repair page. We have more than 25 years of experience serving drivers throughout the Greater Toronto Area, so no-one is more qualified to work on your vehicle.